Following up on the analysis of text-and-image relationships as initiated in the previous conferences on art writing, the 2009 international SAIT conference will focus on color, envisaged as a transversal theme lending itself to a multidisciplinary exploration in perspectives which may be historical, artistic, philosophical, literary and/or linguistic. The goal of this conference is to analyze the role of color not only in the visual arts – painting, sculpture, photography, and the cinema – but also in texts, literary or theoretical, by taking the question of meaning and representation down to its very limits, the ineffable. As a trace irreducible to language, a mark, a spot, or a flash of light which resists both verbalization and the capture of the gaze, color makes the (visual or textual) work of art oscillate between form and lack of form, between the figurative and the figural, the visible and the invisible, the readable and the unreadable, between eloquence and silence. Moreover, the ambivalence of color between light and matter conjures up both the optical and the haptical function of the gaze, both the eye and the hand, the sight and the touch in a dialectical to-and-fro movement corresponding to two modes of viewing and apprehending the text. 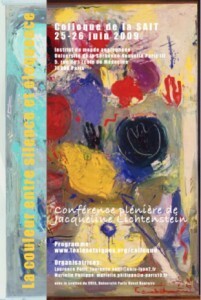 We welcome submissions which relate color in art and color in texts, since it is at the junction between art, literature, and the discourse on art that colorist aesthetics came into being (see Jacqueline Lichtenstein, The Eloquence of Color, The Blind Spot), from the Ancient quarrel between drawing and color (as early as in Plato’s Cratylus) to the liberation of color with the Modernists, via the famous conflict between Poussinists and Rubenists. Along those lines, submissions may also examine the latent or patent manifestations of the often overlooked, and yet, omnipresent ambivalence of color between an intellectual, cerebral, rational, spiritual, purified, and dematerialized pole (austere and mystical conception of color) and an unbridled, sensual, ludic, impulsive, naturalistic and anti-conformist pole (sensual and libertine conception of color). We invite contributors to analyze the ways in which color can open a gap in the image by tearing its legible surface and leaving in it a remainder or a vacant space, as well as the ways in which color, the untamable, eludes “obedience to words” (see Jean-Pierre Guillerm), or is used by some writers to transcend generic boundaries, and in particular to break the limits between the verbal and the visual. Within this view of color as silent inscription, one may consider the specificity of white, as both the arch expression of the inherent silence of colors and a metaphor of the writer’s block, and black, as both the saturation of meaning and a metaphor of opacity and nonsense. Ivan Bargna & alt., La Couleur dans l’art. Paris: Citadelles et Mazenod, 2006. Lichtenstein, Jacqueline. The Eloquence of Color: Rhetoric and Painting in the French Classical Age. Berkeley: University of California Press, 1993. Lichtenstein, Jacqueline. The Blind Spot: An Essay on the Relations between Painting and Sculpture in the Modern Age. Oxford: Oxford University Press, 2008. Deleuze, Gilles. Francis Bacon. The Logic of Sensation. Minneapolis: The University of Minnesota Press, 2005. Elkins, James. On Pictures and the Words that Fail Them. Cambridge: Cambridge University Press, 1998. Gage, John. Colour and Culture: Practice and Meaning from Antiquity to Abstraction. Los Angeles: University of California Press, 1999 (1993). Michel Pastoureau & Dominique Simonnet. Couleurs: le grand livre. Paris: Panama, 2008. 6:00-7:00: Piano Recital: Irena Friedland. Amphithéâtre Richelieu. Paris 4-Sorbonne.